What is another word for Containing? lists, Incorporating, Comprising, container, containers, Embodying, contained. agreements, Records, Forms, Carriers, amounts, liquids, Batteries, Phases, containers. Consisted, constituted, Indicated, Comprised, involved, retained, confirmed, Introduced, conducted, reflected, presented, composed, concerned, implied, Stipulated, reconciled, listed, compound, compounded, Appeared, Provided, advanced, reproduced, understood, defined, Carried, Enshrined, thereto, published, focused, focussed, loaded, Establishing, Gave, Dialed, Dialled, mounted, manned, called, Performed, Chaired, Dealt, set, regarding, sobre, marked, dealing, Incorporating, Comprising. 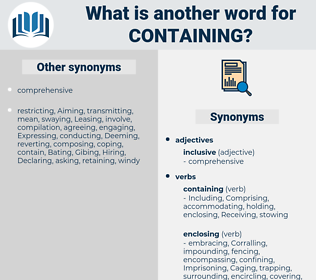 constraining, Constituting, Indicating, Comprised, Consolidating, Pertaining, communicating, encompassing, combining, Maintaining, covering, contributing, Restraining, accommodating, retaining, Anticipating, representing, confining, Explaining, stopping, Detaining, collecting, integrating, Introducing, countering, replicating, depicting, Considering, enclosing, Noting, Mentioning, Collating, cordoning, Commenting, Combating, joining, copying, Guaranteeing, conducting, accompanying, Associating, Amongst, accounting, counting, Duplicating, Suggesting, Gaining, restricting, affecting, compiling, showcasing, demonstrating, pointing, reflecting, Conferring, inhibiting, Citing, Illustrating, regaining, recapitulating, Appreciating, Articulating, Entailing, stockpiling, Delineating, discouraging, Mainstreaming, Attaching, transmitting, Describing, Adding, Transporting, Nominating, Stipulating, Enacting, Outlining, absorbing, Preventing, Denoting, identifying, documenting, Mitigating, protecting, impeding, Evidencing, limiting, reproduced, reproducing, increasing, Specifying, printing, Creating, touching, Producing, register, Notifying, informing, filing, reporting, Mimicking, where, Displaying, Reiterating, compounding, filling, appearing, envisioning, Recognizing, recovering, minimizing, Providing, Addressing, Possessing, highlighting, Arising, recording, matching, stifling, procedure, regulating, imposing, Curtailing, supporting, halting, Submitting, measuring, Prescribing, understanding, Checking, curbing, causing, detailing, Appended, echoing, Requiring, Announcing, Exposing, underlying, repeating, revealing, Adopting, fighting, hiding, reducing, defining, data, Alleging, summarizing, Deterring, Allowing, embracing, Examining, Totalling, forecasting, issuing, Predicting, clarifying, Organizing, Capturing, find, Affording, Delivering, gathering, Advising, surrounding, Envisaging, Employing, bringing, Donating, ending, uniting, Promulgating, Managing, governing, safeguarding, enabling, Certifying, dampening, benefits, posing, Stemming, Storing, summarising, Aggregating, Applying, arresting, cd-rom, Spanning, Granting, yielding, Suppressing, resulting, determining, clustering, Establishing, being, Amending, Experiencing, Devoting, Proposing, Quoting, varying, harbouring, Hosting, assembling, publishing, mastering, focusing, focussing, Realizing, Harboring, formulated, Formulating, slowing, Tabling, tibet, Linking, offering, Placing, Claiming, screening, Forming, ranging, moving, loading, Which, saying, realising, promising, sponsoring, sealing, Intending, killing, Diking, observing, telling, Permitting, Discussing, weighing, Preparing, ensuring, giving, Harnessing, Respecting, Sheltering, supplying, leaving, leading, fixing, Subjecting, planning, grouping, regarding, Embedding, Relying, flying, Expressing, suffering, renewing, reviewing, merging, calling, paying, grading, Stating, regrouping, drawing, wearing, besieging, Reversing, learning, dealing, setting, acting, Resuming, serving, framing, Pooling, housing, raising, speaking, D, sharing, passing, taking, settling, looking, asking, keeping, breeding, braking, returning, S, Requesting, putting, e, figure, drinking, Doing, ferrying, brushing, cutting, numbering, naming, making, Incorporating, Comprising, Embodying. 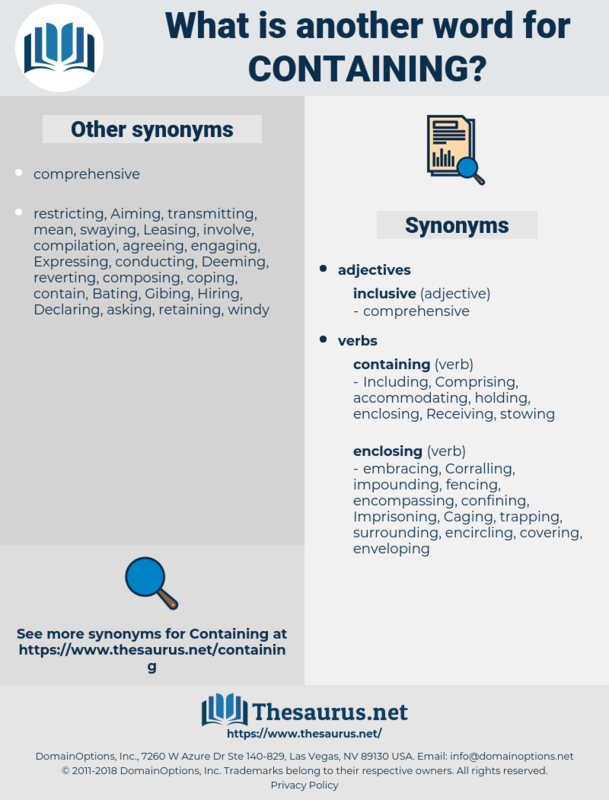 consists, incorporates, encompasses, reflects, presents, publishes, Comprising. Iviza has only one town, of the same name as the island, containing 5500 inhabitants. The divan was a building containing only one room twenty - eight feet long by fourteen wide, and about twenty feet high.